While I owned a number of different headphones, both buds and over ear, some with noise canceling, I do not own any wireless ones. The idea of one more item to charge really kept me away. I even owned an early pair of Sony Noise Canceling ear buds, but they did cancel noise well, and only worked with certain Sony equipment. My go to test for noise canceling headphones is either Bose, or Audio Technica, both over the ear headphones. They work amazingly well. So a chance to try out a new set of wireless noise canceling earbuds was an excellent test for me. I am sorry to say, but Linner’s packaging is not very impressive. The simple white box could use more product info and the graphics are not very appealing. It would not jump off the shelf and yell, “Buy Me!” And it does not get any better when you open the box. Black headphones pushed into a cheap piece of formed plastic did not immediately say quality. The black product gets completely lost in the black plastic, and the holding piece of plastic feels flimsy and cheap. The earphones do come in blue and white as well, so perhaps they look better in this packaging. But was this a bad sign to start? Tossed into the box under a piece of cardboard that held the earphones in place are all the extras. 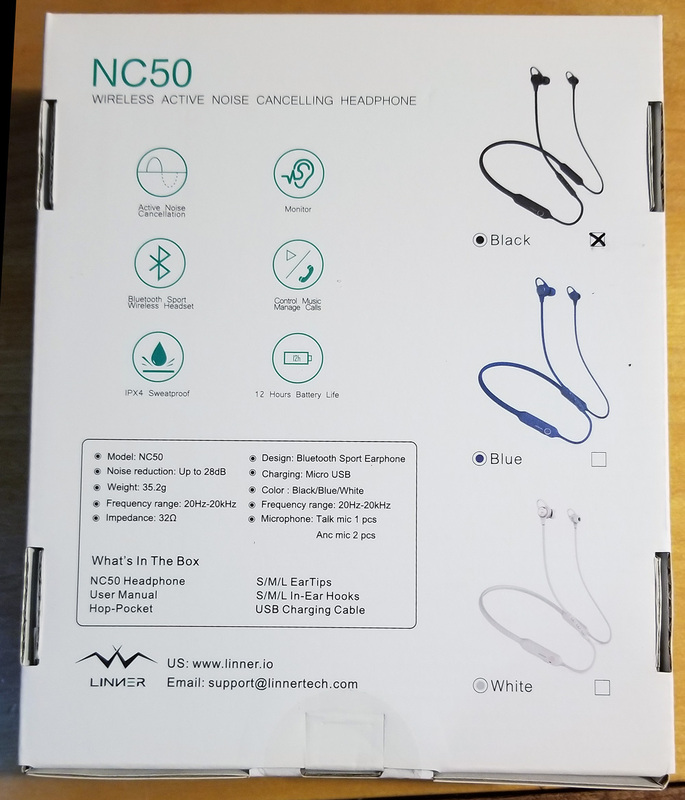 Upon removing the top layer with the headphones, and then another piece of white cardboard holding the plastic in place, you find the included accessories: A small User Guide written in eight languages, as well as two small credit card sized white cards with tips and warranty. There is also a USB to USB-micro charging cable, and a black cloth carrying case. 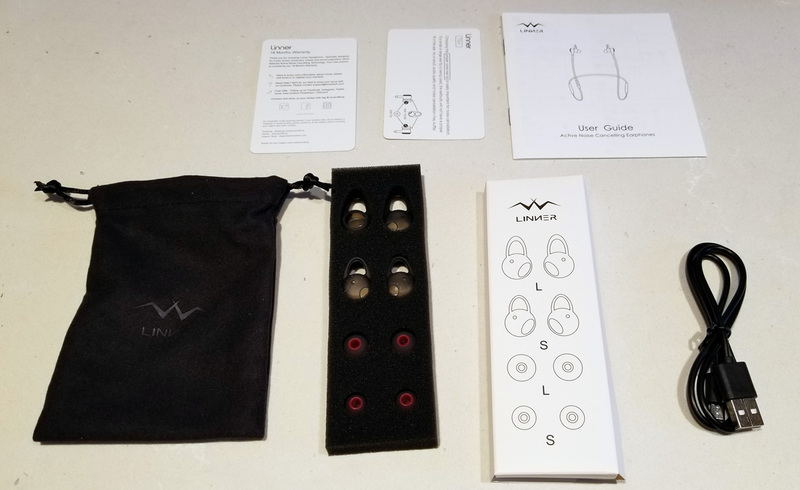 A small rectangular white box holds 4 pairs of different earpieces; a small and large set of ear-hooks, and a small and large set of “ear-tips.” Strangely, the User Guide indicates six ear pieces, small, medium, and large of each. But the small box only had 4. You will find the medium set already attached to the unit. I found the user guide difficult to read even wearing a pair of reading glasses due to a very small font. Not to worry though, there is little good info in there anyway. There is not much to setting up these earphones. Typically recommend with all rechargeable battery devices, fully charge them before using. So time to charge them up. There is a small cover on the charge port which really hides that connector. After opening, I connected the small USB cable to the earphones to charge, and small red LED lit. This light turns green when fully charged. The unit must ship partially charged since my first charge took less than 30 minutes. A full charge can take up to two hours. The unit came pre-equipped with the medium set of ear-hooks and ear-plugs already installed. You can use the unit with or without the ear-hooks (I assume), although to get a much more secure fit, use the hooks. 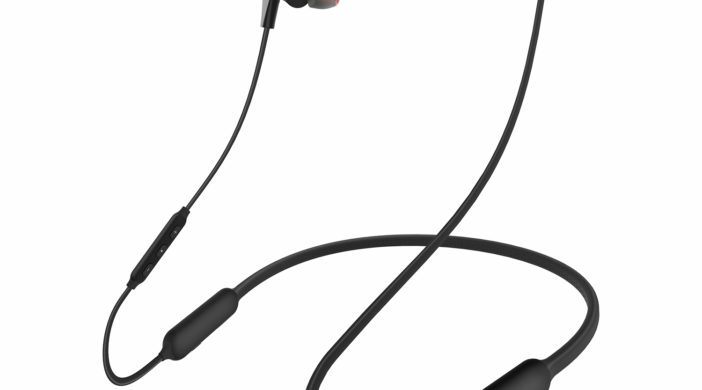 That said, it was not immediately obvious upon looking at the earbud, just how these ear-hooks even functioned. Did they stretch over the ear? Not likely. The user manual is useless on this, as it does not really say anything past some poor Bluetooth pairing instructions. Guess I need to try them on. Sorry for the large blurry image of my ear. It was kind of hard to take a photo of myself from the side, but you get the idea here. Turns out, the hooks catch just inside your ear to help hold the buds in place, and you figure that out when you first try and put them on. I tried some head twisting and shaking, and they stayed put. 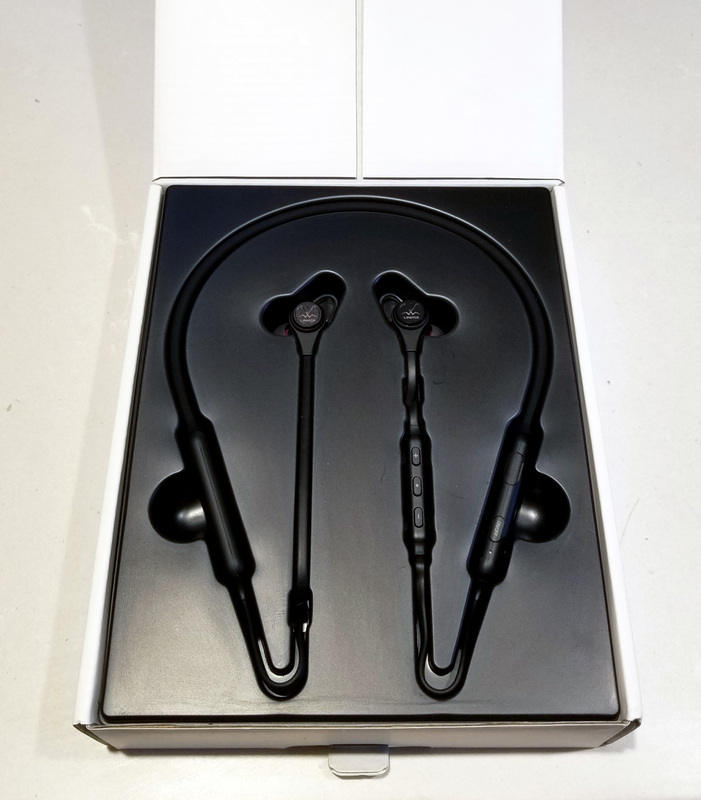 There is no L or R printed on the ear pieces to tell you which goes on which side, so you will need to look at the angle of the ear bud to know which way it goes. And like me, you will get it wrong most times. Hint: Put the controls on your right ear! The thick part of the unit that goes around your neck is quite soft and bendable, and reasonably comfortable. It needs to be flexible to fit into the rather small carrying case included. You loop the large part of the device into a circle, and drop it into the bag when done using. In reality, you probably won’t use the bag. The first step is paring. You must connect via Bluetooth, as this device does not accept a wired connection. This image on page one of the user guide points out the controls. Sort of. It is pretty much the only useful page in the guide other than a table saying what the LED indicates. And even that was not very useful. Ok, where is the ON/OFF button? Back to the small diagram to find ON/OFF, but again, with such small print as to be difficult to see. Then you have to search both ears for the button. Kudos for a slick design on each control pod, but the well integrated button is very difficult to find. OK, I got flashing red/green, now I go to phone, select NC50 in Bluetooth, and the light stops flashing. Was I paired? No really indication of that other than the light stops flashing. One other control you need to know about is the ANC (Active Noise Canceling) button, also on the right ear pod, and a larger, and easier to find button. This turns the ANC on and off. If the environment is quiet, switch off ANC to increases battery life considerably, as ANC requires a lot of processing to cancel noise. More on ANC below. Once in place on my head, I found the controls difficult to reach actually. The right ear pod sits below your right jaw and against your neck. Strangely, the power button and indicator sit rotated against your skin rather than facing outward. Difficult to reach at best. I suggest turning them on before putting them on your head, because there is no way to know if you actually turned them on while wearing them, because you cannot see the indicator. You also cannot see the indicator color to know what mode the device is currently in. Annoying. Turning the unit on requires a 2 second hold of the ON/OFF button, as opposed to a 5 second hold of the same button for pairing. So it is easy, if not paying attention, to put them back into pairing mode rather than switching them on/off. Turning them on took several tries. One time I pressed the switch for 2 seconds, and the light went red for a few seconds, and then went off. What does that mean? The next time I pressed it, the light went green for a few seconds and then went out. What? OK, green is on, and the indicator obviously goes off to save power. So why not just make this a simple quick toggle on/off rather than a 2 second hold? There is little chance of accidentally hitting the button while wearing them. And I needed to assume that green was on, and red was off, but since the headphone was not on my head to hear if it went on, I could not really tell. And to make matters worse, the LED is RIGHT next to the button, so it is very easy to cover the LED with your thumb as you press the button. Sorry, but this is a terrible interface. But wait, there is more. They have really overloaded the LED’s function. Besides the on/off state, and the charging state, and the pairing state, it tells you more. Seems there is a control (a button on the side of the pod) to change the ANC, and it uses the same small LED to indicate mode. Green indicates on, except the LED does not stay on, so how do I know when if ANC is on? But it also indicates Noise Reduction Mode, and monitor mode (more on that later too.) Green means Noise Reduction is on. But yellow means “normal mode.” What is normal mode? The little book does not mention normal mode anywhere. They have also overloaded this larger button. Pressing it quickly toggles between monitor mode and ANC. Monitor mode turns the sound level way down so you can hear surrounding noise and conversation. Pressing and holding it for two seconds puts it in normal mode (whatever that is), and turn the LED yellow. Except, when I did that, the LED went red. It was impossible to know what mode you are in or if you are even changing it properly while wearing them since you cannot see the LED. Luckily, there is a voice feedback for “Normal Mode” when pressing and holding the big button for two seconds. Still do not know what Normal Mode means. Again, empirically, I believe normal mode means turns the noise reduction circuit off. Just a guess though. Total fail on controls. But wait, there is still more. In addition to the pod with on/off and the noise reduction button, further down the same wire is another small control pod, which has buttons for volume up, volume down, and a third button labeled “MFB.” First, the volume up and down button control volume if you press them quickly. But if you hold them, they control next and previous song selections. OK, that is fairly standard. But MFB? I had no idea what that meant, and the book does not say, but I inferred it means “Multi Function Button” because it does multiple things. (Wouldn’t the other buttons also be MFBs?) Oh great, yet another control that does many things. Pressing it once is for play/stop of media. Pressing it twice is for answering a phone call, or if not in a call, it will initiate a redial of your last number called (sometimes). And holding it for 2 seconds turned on the microphone, and on my Samsung phone, initiated a voice search. Ok, that was cool, but will I ever remember all these setting combinations? Well, this really is the real test of any earphone. Bad controls and poor documentation aside, how they sound is really key. OK, first thing I discovered upon putting them on, is that there are more voice prompts that you hear while wearing them and pressing controls. Surprise! No mention of this in the book either. When turning them on, you will hear “Power on, battery high, connected to Bluetooth one”, or “power off” when switching off. EXCELLENT! No wonder I did not need to see the controls. Pressing the ANC button for two seconds also gives a “Normal Mode” voice prompt as well. OK, I can forgive the bad controls a bit now. But still, way overloaded. Now to listening to music, and honestly, I was not at all impressed. 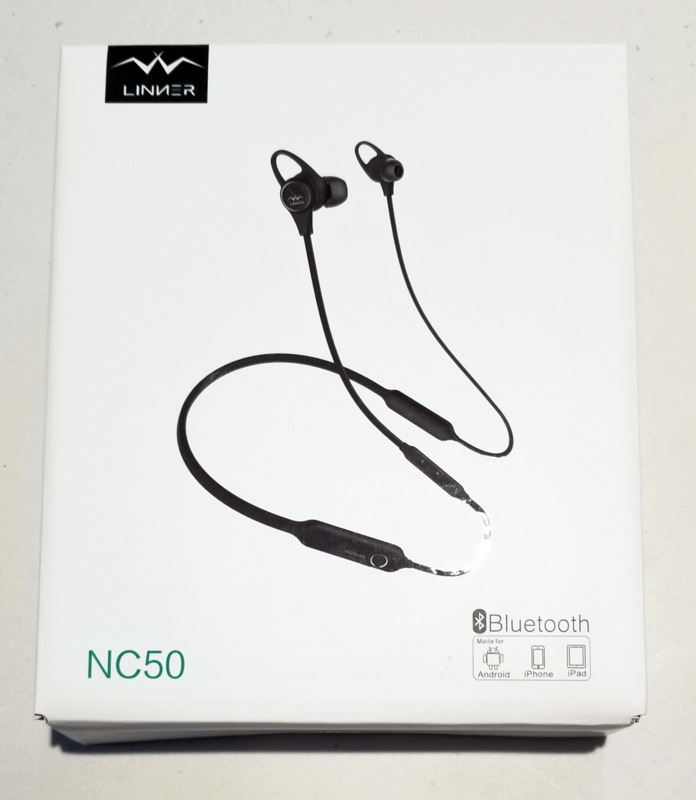 Compared to even cheap headphones that come with your phone, I found these to be tinny sounding, and seriously lacking any decent bass response at all. Turning up the volume added quite a bit of distortion to the sound at higher levels, so they do not get that loud and sound good, even at your device’s full volume..
Their website claims “mega bass and clear mid tones.” I’ll give them the clear mid tones, as that is all I really hear. As for mega bass, I did not hear any bass at all. I also heard seriously clipped highs. As suggested on their website, I tried each of the three sized ear pieces to see if it helped, and sadly it made no difference to me. I did find pressing them deeper into my ears helped with the bass response, but the units would not stay there on their own, so that was not much help. I also made a few phone calls to see how that sounded, and for calls, they worked well. Phone calls are frequency limited and lie directly in the mid-band range, so not surprising. The microphone worked well as well, and the calls were clear and easy to hear. As for ANC, a key advertised feature of this unit, I heard almost no difference at all between ANC being on or off. The music does get a small bit louder when ANC is on however. Other than that, I heard no significant drop in surrounding noise levels. I tried sitting in front of a noisy fan, and playing white noise on my stereo, and going out into traffic. On or off, it sounded mostly the same to me. I guess, given all those controls, maybe I forgot to press something, but I think not. I also tried the different sized ear buds as suggested (sort of) in the manual to see if that would help with ANC. Nope! Sadly, for noise canceling, I did not like these anymore than my first pair of Sony noise canceling ear buds, although the Sony’s had much better music response. Lastly, I did like the monitor function. It was great to be able to mute (mostly) the music and hear your surroundings without taking off the earphones. But since I could not tell if ANC was actually doing anything, I could not tell if monitor also switched off that function. Battery: 200 mAh for approx. 13 hours of continuous music playback. LED indications of some functions, including on/off, Bluetooth, and charging. I say pass. I cannot in good faith recommend these headphones. First of all, I felt the sound was awful, and that is really bad for headphones. Awful controls, even with the voice prompts, with way overloaded functions on each button. And the user manual is mostly useless and WAY too small to read. What a disappointment. MyMac Reviews rating is 3 out of 10. Good idea, and they are quite comfortable and stay in your ears. Just wish they sounded better and they had better controls.